"Bersih" movement run by Soros-funded frauds seek to restore IMF functionary Anwar Ibrahim to power. April 29, 2012 - In a repeat of last summer's protests, yellow-shirted mobs calling themselves "Bersih" have taken once again to the streets in Malaysia demanding "clean elections." Their tactics and demands mirror similar movements that have come out into the streets in Russia and across the Middle East, and just like in Russia and across the Middle East, they are entirely funded, directed by, and working for the interests of Wall Street and London. Bersih's rank and file are responding to legitimate concerns regarding inequities that exist across Malaysia's diverse population. Ethnic Malaysians are perceived to be receiving more benefits and upward social mobility than Malaysia's large groups of ethnic minorities. Likewise it is perceived that Malaysia's ruling government has an unfair advantage come election time. However, the movement's demands and tactics seek simply to destabilize Malaysia politically and return known Western collaborators, and in particular Wall Street proxy and International Monetary Fund (IMF) functionary Anwar Ibrahim, back into power. Video/Image: NED and Soros organized mobs clamor around Malaysia's embassy in Bangkok, Thailand - with SEAPA executive director Gayathry Venkiteswaran explaining to a crowd why Western proxy Anwar Ibrahim and his opposition's involvement in Bersih should not be condemned and for Bersih supporters to vigorously deny that the movement is "opposition run." SEAPA is funded by convicted criminal George Soros, and the US State Department's warmongering, corporate financier-lined National Endowment for Democracy and Freedom House. Both within Malaysia and beyond, the Bersih mobs are demonstratively led by Western proxies insidiously manipulating impressionable, youthful crowds. To understand why, it helps to understand just who is financially and politically supporting Bersih's leadership in the first place. 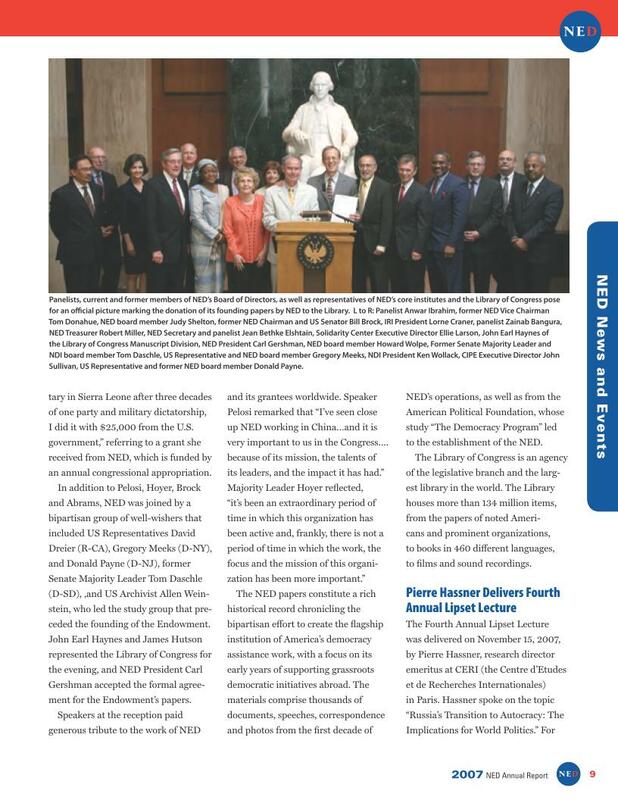 The Malaysian Insider reported on June 27, 2011 that Bersih leader Ambiga Sreenevassan "admitted to Bersih receiving some money from two US organisations — the National Democratic Institute (NDI) and Open Society Institute (OSI) — for other projects, which she stressed were unrelated to the July 9  march." 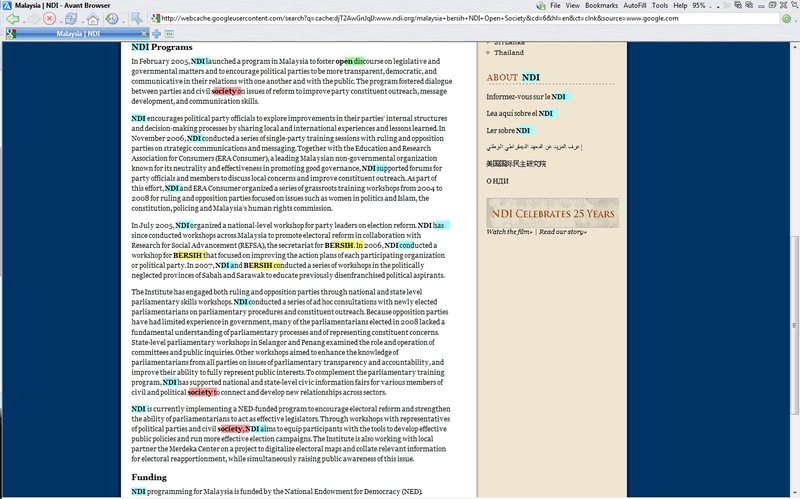 A visit to the NDI website revealed indeed that funding and training had been provided by the US organization - before NDI took down the information and replaced it with a more benign version purged entirely of any mention of Bersih. For funding Ambiga claims is innocuous, the NDI's rushed obfuscation of any ties to her organization suggests something more sinister at play. Bersih is indisputably serving as a political vehicle for Anwar Ibrahim and Malaysia's opposition front "Pakatan Rakyat," to return to power. That Anwar Ibrahim himself was Chairman of the Development Committee of the World Bank and International Monetary Fund (IMF) in 1998, held lecturing positions at the School of Advanced International Studies at Johns Hopkins University, was a consultant to the World Bank, and a panelist at the Neo-Con lined National Endowment for Democracy's "Democracy Award" and a panelist at a NED donation ceremony - the very same US organization whose subsidiaries are funding and supporting Bersih - casts irrefutable doubt on their official agenda for "clean and fair elections." Claims by Bersih members that Anwar Ibrahim is "hijacking" their movement ring especially hollow when looking at both his and Bersih's entwined foreign financial and political backers. Unlike during their 2011 protests, Bersih is now taking to the streets with the full knowledge of what "pro-democracy" protests have yielded in Tunisia, Libya, Egypt, and Syria - chaos, destabilization, violence, and the inevitable installation of overt client regimes bent in service to Wall Street and London. They are now openly the recipients of convicted criminal George Soros' Open Society Institute, which is quickly losing its luster as its vast global ties are exposed by an ever-expanding alternative media. In Tunsia we see the rise of one of Anwar Ibrahim's National Endowment for Democracy contemporaries, Moncef Marzouki who was declared "president" after US-backed mobs took to Tunisia's streets in early 2011 and overthrew the government there. Since Marzouki's installation into power, he has promptly backed Western policy in regards to Libya and now Syria, most recently severing ties with Damascus to help bolster the West's campaign of isolating and eventually topping Syria's government. 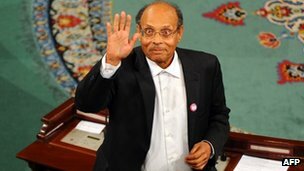 Photo: Tunisia's new "president," Moncef Marzouki, a veteran Western collaborator whose last two decades of political activity, much like Anwar Ibrahim of Malaysia, have been supported and subsidized by the US government and US corporate-financier funded foundations. In Libya, promises of a democratic utopia have been lost amidst perpetual infighting, genocidal death squads roving the country committing widespread atrocities, entire regions of Libya peeling away from the government based in Tripoli, which itself is nothing more than a Western client regime. 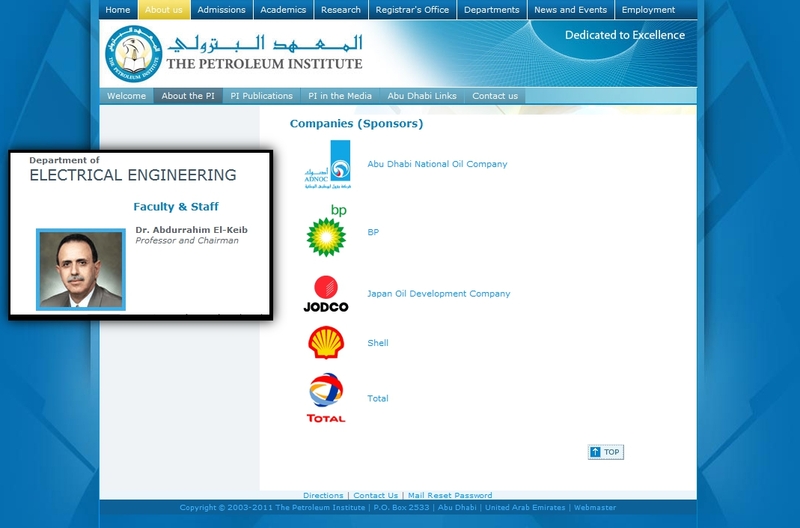 Led by long-time US resident Abdurrahim el-Keib, formally of the Petroleum Institute, sponsored by British Petroleum (BP), Shell, France's Total, the Japan Oil Development Company, and the Abu Dhabi National Oil Company, it has done nothing to restore order or to preserve Libya's territorial integrity, and has instead spent its time brokering deals to sell Libya's once nationalized resources to foreign contractors. Clearly it is not "democracy" that the US through its National Endowment for Democracy and criminal Wall Street speculator George Soros' Open Society are spreading - but rather corporate-financier hegemony by destabilizing nationalist regimes and replacing them with client proxies. The recent wave of "pro-democracy" uprisings worldwide are a carefully orchestrated geopolitical gambit - neo-imperialism through 4th generation warfare. 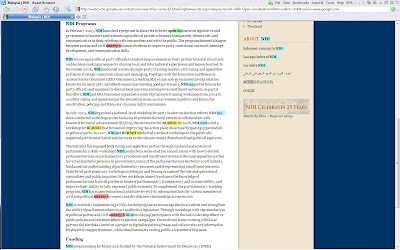 That the leaders of Bersih are demonstratively recipients of both the US State Department's National Endowment for Democracy and Soros' Open Society, and with opposition leader Anwar Ibrahim being a functionary of the IMF, it is certain that no matter how genuine Bershi's rank and file may be, the fruits of their efforts will be the destabilization and neo-recolonization of of their nation - a nation that has fought long and hard to work its way out from under Western imperialism in the past.